Lewes were forced to settle for a replay despite taking the lead twice in an entertaining 2-2 draw at Farnborough in the FA Cup first qualifying round, reports Tom Harper. Darren Freeman made two changes to the side that beat Molesey 8-1 in the preliminary round replay on Wednesday, with Bouwe Bosma and Luke Blewden replacing Michael-Dome Bemwin and Billy Medlock in the starting line-up. There were very few clear-cut chances of note for either side for most of a tight first half, although Lewis Carey had to be alert to deny Perry Coles twice early on. Lewes were looking dangerous when they had the ball, and saw James Hammond draw a smart save from Lenny Pidgeley in the Farnborough goal at the end of an impressive passing move. The game became more end-to-end as the half progressed, with the unmarked Jerry Puemo heading wide for the hosts, before Hammond saw a 25-yard free-kick pushed round the post by Pidgeley. The final chance of the half fell to Farnborough, but Connor Calcutt saw his header from a Puemo free-kick tipped over by Carey. Darren Freeman made two changes at half-time, with Charlie Coppola and Nico Cotton replacing Harry Reed, who picked up an injury towards the end of the first half, and Ronnie Conlon. The changes paid dividends for the Rooks within three minutes of the restart, as Nico Cotton finished from close range at the end of a goalmouth scramble that had been started by the winger playing Bosma through on goal. This goal galvanised Lewes, who saw Luke Blewden just miss the target from close range, before Pidgeley did well to claw a deflected Blewden cross away from goal and save Leon Redwood's effort on the rebound as the Rooks looked to double their lead. Lewes were made to pay for these missed chances on the hour mark, as a quick counter-attack down the right ended with Michael Fernandes crossing for Calcutt to finish from close range to level the scores. The Rooks regained their lead after 63 minutes through Lloyd Cotton, who met a Hammond free-kick with a thumping header which Pidgeley was unable to keep out. 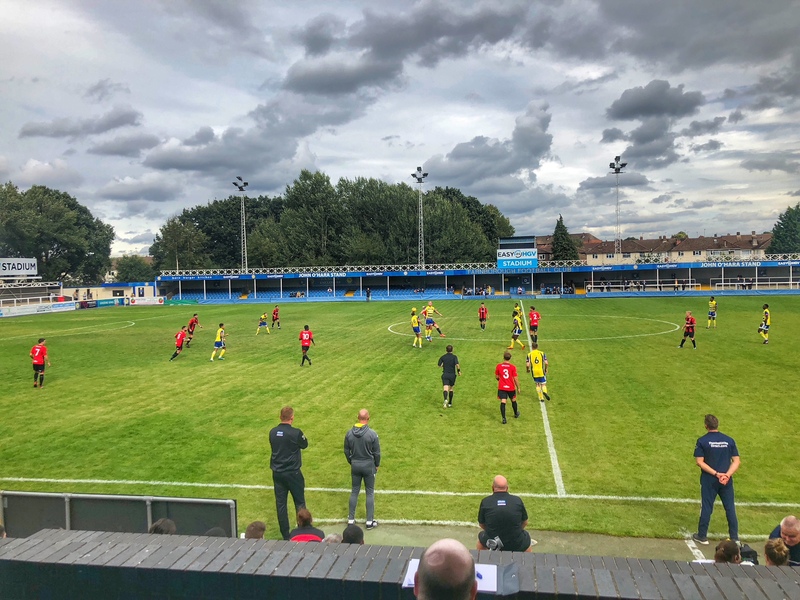 Farnborough were behind for even less time on this occasion though, and equalised for a second time within a minute, as Kurtis Cumberbatch guided a Luke Robertson cross past Carey after the Rooks had been unable to clear a long throw. The game was very even heading into the closing stages, but Lewes were handed an advantage with five minutes remaining after the hosts saw defender Nathaniel Oseni, who was the last man, sent off for pulling Billy Medlock back 30 yards from goal. Despite this, Farnborough came close to taking the lead for the first time almost immediately after the dismissal, as Calcutt saw a powerful header superbly saved by Carey, before the unmarked Coles headed another a long throw over the bar from point-blank range minutes later. The Rooks dominated the final few minutes, with Coppola and Medlock both narrowly missing the target as they looked to find a late winner. Their best chance came deep into stoppage time, as Omarr Lawson was played in by Redwood, rounded Pidgeley and cut the ball back from the left for Coppola, whose touch at the far post was too heavy and allowed the hosts to clear in the final meaningful action of the game. Post match Ross Standen spoke to Barry Collins about the performance and the spirit in the squad. Lewes will hope to build on the positives of this performance and progress to the second qualifying round when they host Farnborough at the Pan in the replay on Wednesday, kick-off at 7.45pm. Farnborough: Pidgeley, Oseni, Puemo, Appau (Cullen 79), Fagan, Robertson, Fernandes, Murphy-McVey (King 62), Coles, Calcutt (Fearn 90), Cumberbatch. Unused Subs: Louis, Stroud, Jeacock, Rhule. Lewes: Carey, Bosma, Reed (Coppola 46), Redwood, L. Cotton, Freeman, Brinkhurst, Hammond, Conlon (N. Cotton 46), Lawson, Blewden (Medlock 73). Unused Subs: Dome-Bemwin, Jenkins, Headland, Omofe.